$20,000 for Lot 22, MAC TOPEKA 159T, a black polled purebred Salers bull sired by MAC Nox 382N and out of a daughter of JMAC Granite 5G. Sold ¾ interest and full possession to a partnership of Ahtahnum Valley Salers of Yakima, WA and The Topeka Syndicate. Syndicate members include Bodine Brothers of Velva, ND; Deep Creek Salers of Mitchell, NE; Elm Creek Ranch of Hebron, ND; J Reverse J Cattle Co. of Morgan, UT; McIver’s Happy Acres of Farwell, MN; MJB Salers of Lodge Grass, MT; Skookum Farms of Montesano, WA; Southern Eagle Ranch of Evington, VA; Sunken Canyon Ranch of Buhl, ID and Willis Farms of Frankfort, KY.
$5250 for Lot 86, MAC TOPGUN 71T, a homozygous black polled 75% Salers and 25% Angus bull sired by MAC Navigator 281N and out of donor cow MAC Dolly 99D. Sold to Wolff’s Polled Salers of Aplington, IA. $5100 for Lot 132, MAC TANNEY 204T, a black polled 50% Salers and 50% Angus Optimizer Composite son of MAC F1 Pacesetter 171P and out of a daughter of GDAR Royce 131. Sold to Randal Hruska of Windsor, CO.
$4500 for Lot 139, MAC TRENTON 40T, a homozygous black polled 37.5% Salers and 62.5% Angus Optimizer Composite son of Rito 1I2 of 2536 Rito 6I6 and out of a daughter of AP Polled Magistrate. Sold to Ray & Tim Erbele of Streeter, ND. $4250 for Lot 6, MAC TORPEDO 9T, a black polled purebred Salers bull sired by Big Sky Triton 40R and out of a daughter of S Nebraska 330N. 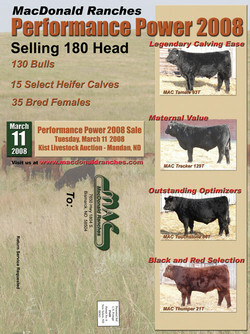 Sold to J Reverse J Cattle Co. and 2C Ranch, both of Morgan, UT. $4250 for Lot 28, MAC THUNDERBOLT 197T, a black polled purebred Salers bull sired by Big Sky Triton 40R and out of a daughter of MAC Kickoff 200K. Sold to Gary Mehling of Torrington, WY. 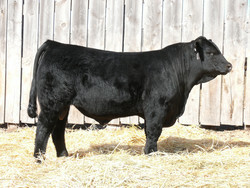 $4250 for Lot 110, MAC TUSCANY 46T, a black polled 50% Salers and 50% Angus Optimizer Composite son of MAC F1 Rainstar 15R and out of a daughter of AP Pld Dynamite. Sold to Bob Steffan of Dickinson, ND. $4250 for Lot 114, MAC TRAIL DUST 16T, a black polled 50% Salers and 50% Angus Optimizer Composite son of Rito 1I2 of 2536 Rito 6I6 and out of donor cow MAC Black Flora 6F. Sold to Vernon Burkle of Gackle, ND. $4250 for Lot 117, MAC TRAILDUST 96T, a red polled 50% Salers and 50% Red Angus Optimizer Composite son of Leachman Up The Canyon and out of a daughter of MAC Momentum 3D. Sold to Red Genetics Ranch of Wagner, SD. $2600 for Lot 147, MAC TAYLOR 118T, a black polled purebred Salers open yearling heifer sired by MAC Prairie West 378P and out of a daughter of S Nebraska 330N. Sold to Elm Creek Salers of Hebron, ND. $2600 for Lot 148, MAC TOVEY 146T, a black polled purebred Salers open yearling heifer sired by GGT P Redford 18R and out of a daughter of AP Pld Dynamite. Sold to Ricky Hogue of Marshall, AR.